*This page contains affiliate links, which means I earn a small commission if you make a purchase from these links. For more information, see my disclosures page. 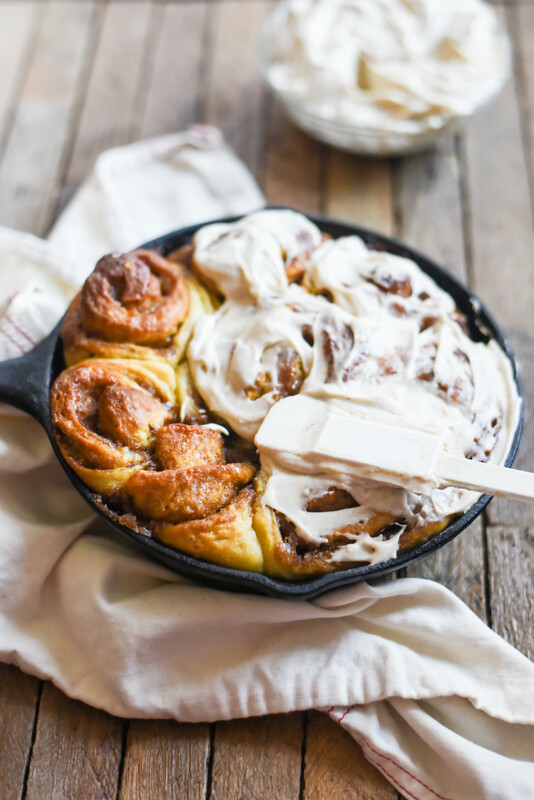 Cinnamon rolls on Christmas morning (or any morning, for that matter) are a nostalgic endeavor for me. From my childhood through my college years, it was usually a can of store-bought rolls with the little cup of icing. 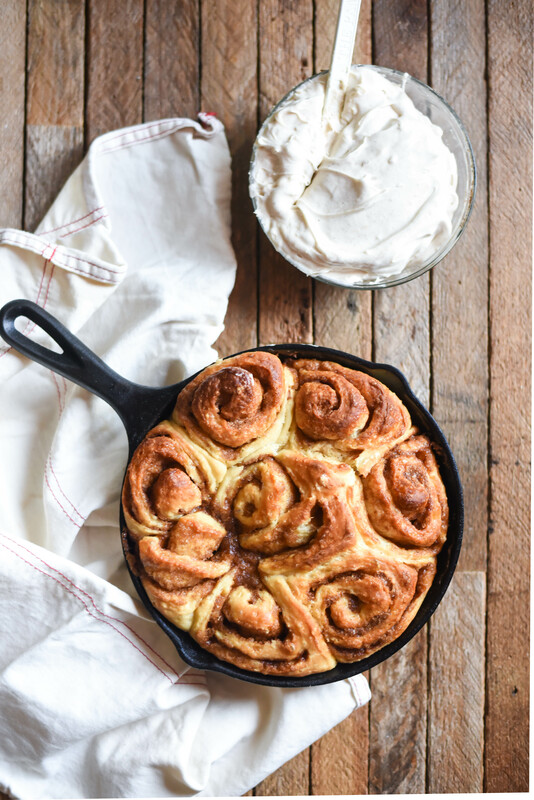 It wasn’t until my young adult years that I discovered the magic of homemade cinnamon rolls. Unfortunately, there’s no quick way to make them, but you are certainly rewarded for your labor. Christmas morning is one of those special occasions that warrants the extra time and care to make these rolls. You can make the rolls and icing the night before, then all they need is a quick rise and 35 minutes in the oven in the morning. You may remember this brown butter + cream cheese icing from my brown butter + chocolate ganache cake in November. It’s pretty much my new favorite icing to put on everything. I discovered this brioche recipe from the book The New Artisan Bread in Five Minutes a Day , and I love it for several reasons: it’s quick to mix together, it’s sweetened with honey, and it’s delicious. I add a little more flour than their recipe calls for because I found it to be too sticky, but other than that, the credit is all theirs. I add ginger and cardamom to the filling for more depth, but you can totally stick with just cinnamon. I tend to crowd my pans so it’s more like a cinnamon roll casserole instead of distinct rolls (you get more gooey, soft parts that way). I usually use my big 12-inch Lodge Cast Iron Skillet or two 8-inch Lodge Cast Iron Skillets . They don’t always turn out looking perfectly spiraled or even, but they’re always delicious. And that’s a win in my book. While dough chills, make filling and brown the butter for the icing. Mix all filling ingredients together in a small bowl until a paste forms; set aside. Brown butter by heating over medium heat, swirling occasionally, until brown specks begin to appear on the bottom of the pan and it has a nutty aroma. This usually takes 3-10 minutes, depending on your pan, stove, and beginning butter temperature. Pour butter into a heatproof bowl and place it in an ice bath, careful to not get water in the butter. Stir until butter is opaque again. If making ahead, chill browned butter in refrigerator (an hour or more), and allow to sit at room temperature for a few minutes before making the icing. Once dough is chilled, turn out onto a floured surface and sprinkle top of dough with more flour (it will still be quite sticky). Roll dough into a roughly 12” by 20” rectangle about ¾” thick. Spread filling over dough as evenly as possible, leaving a 2” margin on one of the long sides. Start rolling the dough inward from the long side opposite the margin, tucking as you go to keep the roll tight. Once all of the dough is rolled, pinch the seam together to seal. Cut dough crosswise into 16 equal pieces. I use a piece of unflavored dental floss to cut the rolls; slide floss under the dough roll, cross the ends, then pull in opposite directions until roll is sliced. 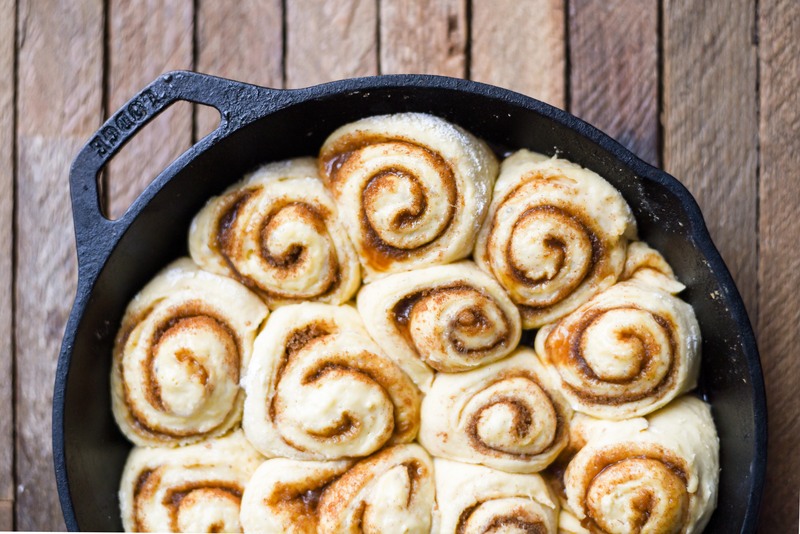 Place rolls in a greased 9” x 13” pan, a 12” cast iron skillet, or two greased 8” round pans so that the sides touch. Cover pan(s) with plastic wrap. If making immediately, let dough rise again for at least 30 minutes before baking. Alternatively, refrigerate rolls overnight, and allow to sit at room temperature for at least 30-45 minutes before baking. Preheat oven to 350°F. Place pan(s) on a large baking sheet in case any filling spills over. Bake for about 35 minutes or until the tops are browned and the middle is mostly set. Meanwhile, make icing by beating together the resolidified browned butter and softened cream cheese with an electric mixer. Add powdered sugar gradually, then add milk 1 tablespoon at a time until you reach your desired consistency. (This step can be done ahead of time). Ice rolls immediately after baking. If baking the rolls ahead of time, reheat them for about 15 minutes in a 350°F oven or microwave for 1-2 minutes. these look amazing and my husband would def approve ha! I’m definitely trying these for one Saturday morning!! Your grandmother Smith is fascinated by hearing all of what you are making! Thanks for telling her, Wren!